National Grandparents Day is coming up on September 10. 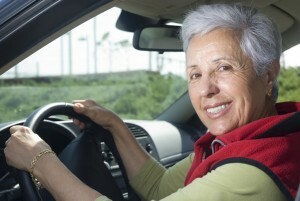 Whether you’re a proud grandma hoping to treat yourself, or you want to surprise your elderly parents with a new car, watch for these must-have features for senior drivers. The benefits of backup cameras aren’t lost on the federal government, which is why regulations will require all new cars to have this feature by mid-2018. Some cars still lack backup cameras as a standard feature, but it’s highly recommended for senior drivers who may find it difficult to twist and crane their necks to look behind them. Cross-traffic alert is another feature that often comes with backup cameras. This warns you of any oncoming cars when backing out of a parking spot. Most new cars today have a touchscreen built into the dashboard, but they’re not all created equal. Look for a car that offers an easy-to-navigate screen with large fonts. Because many seniors are unfamiliar with touchscreen technology, a style with simple controls and graphics is especially beneficial for this demographic. Senior drivers are all about comfort, and why not? You’ll be happy to hear that heated seats are becoming increasingly common today, meaning you don’t have to spring for a luxury car to enjoy this feature. With heated seats, both driver and passenger warm up faster on cold winter mornings. It’s also a beneficial feature for seniors with chronic back pain. Look for a car with temperature adjustments for the seat back and bottom to customize the heating experience. Seniors don’t want to fiddle around in their pocket or purse for the car key. Keyless entry makes life a little easier. Thanks to proximity sensors, the key need only be near the car for the doors to unlock. Push-to-start ignition goes right along with keyless entry. You can keep your keys tucked away and simply push a button on the dashboard to start the engine. This is a much-improved option over fumbling around with the keys and trying to turn on the car with arthritic wrists. That’s why it’s a must-have feature for senior drivers. Minivans and SUVs have lift gates that open to reveal a spacious cargo area. Ordinary lift gates may be too heavy for seniors to close without straining themselves. That’s where power lift gates come in. This feature is becoming available on more mid-range minivans and SUVs, allowing drivers to open and close the lift gate just by touching a button on the key fob or inside the vehicle. Manual seats require you to fumble around with levers, switches, and bars, using your weight to throw the seat forward or back. This can be difficult for seniors who lack strength, flexibility, and dexterity. Power seats are a definite upgrade. They have small buttons on the side that allow for effortless adjustment. Some cars only have a power driver seat, so if you regularly drive other people around, look for a vehicle with a power passenger seat as well. Memory settings are extra useful if more than one person regularly drives the car. You can program multiple preferred seat settings that quickly resume after someone else has driven the car. A fancy new car may seem impervious to breakdowns, but to keep your new car running reliably for years to come, you must schedule routine oil changes and tune-ups from day one. Scott’s Fort Collins Auto is the right place to go for dependable services at competitive prices. We maintain and repair cars of various makes and models, both domestic and foreign. Give us a call today at (970) 682-4202 for answers to any questions you have or to schedule your next appointment!